(Above) The crossing point between the dropped kerbs on Cranbrook Mews E17 is ingeniously barricaded with ASDA trolleys. (Below) This footway on Roberts Road E17 is regularly obstructed. Today it was a road contractor. (Below) But on Sundays it's churchgoers. AA president Edmund King said: "With family budgets under the cosh from rising pump prices, it defies all logic for the Government to increase fuel duty. "Drivers will pay the higher pump prices to go about their daily lives but have to find other ways to reduce costs. Let’s unpack the ubiquitous one's latest idiocy, shall we? It’s a bizarre mixed metaphor to talk about a budget being “under the cosh”. To use analogies with violence is particularly stupid, since less car use means less road violence. And needless to say King’s homely reference to “family budgets” excludes all those households which don’t have a car and won’t therefore be affected by a tiny rise in fuel prices. The underlying thesis is that car use is a necessity, which of course we know it isn’t, not with most car journeys in Britain being less than five miles. Far from it defying all logic, it makes perfect sense to raise fuel duty. It’s the fairest form of motor taxation, since it hits hardest those who use their cars most. Secondly, it’s fair because it hurts gas guzzlers more than it hurts those with fuel-efficient cars. Thirdly, it hurts the accelerate-and-slam-on-the-brake brigade more than it hurts the careful driver, since how you drive affects how much fuel you use. And finally it makes perfect logic in terms of impending climate catastrophe and the need to restrain car use. As usual, Edmund King is spouting car supremacist rubbish – but it’s rubbish which all sections of the media are keen to publicise. He was strolling along a residential street in the Latin Quarter of the seaside town when police received a call reporting an “eccentric looking old man". "It was an odd request because it was mid-afternoon, but it’s an ethnic Latin area and the residents felt the man didn’t fit in. Let’s just say he looked eccentric. "We dispatched a young woman officer. "He was on a walkabout but she wasn’t entirely convinced of his innocence. She took him back to the hotel to check his papers, then she called us to check who Bob Dylan was." A FOUR-year-old boy suffered serious head injuries when a car smashed into a garage. This occurred in Swindon, where the Conservative council has shut down all the town’s speed cameras, A political decision based on a dodgy use of statistics rather than a road safety one, since to describe revenue from safety cameras as a 'tax' is emotive, but not true. Five wall-mounted “overt” cameras and several hidden recording devices will be in place by March 2010. Swindon Community Safety Partnership also aims to have a central hub controlling 40 town centre cameras in place by that date. Is Mr Bean fit to drive? Rowan Atkinson has smashed his Audi convertible car into a dustcart. According to The Sun, the Mr Bean star emerged from the crash with bruising on his face and ribs, and has destroyed his motor. A friend said: "It's a mangled wreck." The driver of the cart did not receive any injuries. Atkinson has had three additional car accidents in the last ten years - two in his Aston Martin V8 Zagato, worth £100,000, and one in his £650,000 McLaren F1. Some years ago he lost his licence for speeding, which seems to have made no impact on his style of driving. Doubtless the police and CPS will decide that a regular celebrity offender smashing into a refuse truck is a trifle not worth pursuing. Knife crime! The threat of terrorism! Shootings! But needless to say there is no moral panic about drivers who ‘lose control’ of vehicles which they are patently unfit to drive and which they crash through reckless speeding. A 17-year-old youth has died after the car he was driving struck a lamppost in the village of Ravenstruther in South Lanarkshire. A 19-year-old woman has died and a man is critically ill after a car crashed into a fence in Greater Manchester. Officers were called to the A49 Warrington Road in Newton in the early hours of Friday and found a man and woman trapped inside an MG sports car. A 32-year-old man has died after a car left a mountain road and dropped down an embankment. Dominique Williams, 20, from Maghull, died after the car in which she was travelling with friends to the Creamfields music festival flipped over and hit a lamppost. Nicola Edgar, 21, from Darlington, was also killed while two other female passengers were seriously hurt in the smash. There’s a little bit of a riot going on down at The Bell corner NOW! The Metropolitan Police has hired computer specialists to help it decipher what is being said about the force on the internet. A Met spokesman said: ‘We are not monitoring in a criminal sense, we are looking to use the sites to get our message out there. We are simply monitoring how we are perceived. Well, this blog perceives you as a deeply prejudiced and ineffective organisation which colludes with driver criminality and is a willing partner in promoting anti-social behaviour and extreme violence across London. Will that do? HK55 AJX, male driver, white van, driving while chatting on a mobile phone, Kitchener Road E17, 2.17 pm, today. • Accident rates per kilometer are 26 to 48 times higher for bikes than for automobiles. • Nearly 44,000 cyclists have died in traffic crashes in the United States since 1932 (the first year in which estimates of cyclist fatalities were recorded). • U.S. cyclists are three times more likely to be killed than German cyclists and six times more than Dutch cyclists, whether compared per-trip or per-distance travelled. • According the British Medical Journal, the most important deterrent to riding bikes expressed by non-cyclists is fear of motor traffic. • While motorists often accuse cyclists of being the cause of bike-car accidents, a Toronto analysis of 2572 police collision reports (Table 1) demonstrates that this is actually not the case. The most common type of crash in this study involved a motorist entering an intersection controlled by a stop sign or red light, and either failing to stop properly, or proceeding before it was safe to do so. The second most common crash type involved a motorist overtaking unsafely. The third most common type of crash is a motorist opening a door onto an oncoming cyclist. In fact, cyclists are the cause of less than 10% of bike-car accidents in this study. I doubt those who designed these initiatives cycle. In most estates, bike paths are placed so close to pedestrian sidewalks that they become paths for prams and joggers, essentially making it even more hazardous. And some even have drain gratings on them. But after having skidded on them on my slicks and getting my thin tires caught between the gratings more than once, I generally avoid said paths. Park connectors are nice, but in reality do not really connect. They are just glorified cycling paths. And they lead to nowhere in particular, making them useless for everyday commutes. Waltham Forest acting borough commander Sue Williams said: “It is our duty to provide the best possible service to the public and this includes being visible on the streets and in your neighbourhoods to prevent crime from happening in the first place. Which is complete garbage, as I hardly ever see police officers on the streets of the borough, and when I do they are usually in cars, driving like lunatics with sirens blaring and blue lights flashing (and when they are not driving like lunatics they are parked on the pavement, in an Advanced Stop Line, or condoning pavement parking by bullion drivers). The Metropolitan Police does not enforce ASLs for cyclists and is contemptuous of its duty of care to vulnerable road users. It is complicit in driver crime by declining to take it seriously. Speeding, red light jumping, ASL obstruction and drivers on handheld mobiles are all at epidemic proportions locally, and Sue Williams, like Commander Mark Bowden, doesn’t give a damn. I wasn’t surprised either to learn that Walthamstow is a burglary hotspot. WF55 FRP Male driver, Oriental appearance, chatting on handheld mobile phone while turning off Lea Bridge Road into Hoe Street, 10.10 am, 28 August 2009. T514 KLD Small saloon car, black woman driver chatting on handheld mobile phone, Hatherley Road E17, 9.50 am, 28 August 2009. G4 PDP Grey/silver flash sporty car (BMW? ), black woman driver chatting on handheld mobile phone while driving through a crowded shopping area, Hoe Street, 12.10 am, 27 August 2009. Inflatable wheel supports and jetpack advisable. 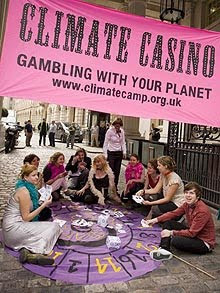 For good updates on the climate camp check out this local Blackheath blogger. They are put in place purely so that councils and the government can spin their propaganda of how they are encouraging green attitudes in the public. The husband of Catriona Cockburn, the cyclist killed in an incident involving an HGV close to Oval tube station in June, is asking for witnesses to come forward. Even if you did not see the incident directly, you may still have useful information on the lead up to, or aftermath of the incident. So, please, I urge you to come forward. Any information, no matter how insignificant it may seem, may be crucial to the case. I think we can all agree that the greatest menace which society faces are high-speed joggers, who come belting along the pavement dressed in tracksuits. I am therefore delighted to see that the Council has introduced a speed limit on the pavement on Erskine Road E17, to curb these dangerous bipeds. God bless you, Bob Belam! The contractors employed by Network Rail to work on Queens Road station, Walthamstow, are doing a magnificent job of obstructing the pavement and the station cycle stands. But sometimes they aren't trying hard enough. For example, this van driver today successfully blocked off three cycle stands but still left one available for use. How is cycling ever going to be completely suppressed with laxity like this? Two years ago today a local cyclist on his way to work was run down and killed by a hit and run driver. The Metropolitan Police have failed to find his killer, which is not a surprise since London’s spectacular record of unsolved hit and runs is surely related to the Met’s contempt for road traffic policing and the fact that it puts far less resources into road fatalities than it does to murders. At the time the local paper carried a story suggesting that the killer driver quickly turned into a side street, parked their damaged car, and did a runner, only returning later in the day to collect the vehicle. The implication seemed to be that the Met does not bother to search nearby streets in the aftermath of a hit and run. If that is true, it wouldn’t surprise me at all. I blogged about the fatality here. I can’t help noticing the difference between the killing of Michael McLean, which provoked no comment at all from Commander Mark Benbow or council leader Clyde Loakes, even though they both bore a direct responsibility for the reckless and lawless speeding on Forest Road E17, which continues to this day, and the knife death of C J Hendricks, where both Benbow and Loakes rushed to issue statements of sympathy and condemnation. Today, an anonymous young man accused of Mr Hendricks' murder has been acquitted of the charges. He had successfully put forward a defence that CJ Hendricks had himself been an aggressor with the knife that killed him, in a far more complicated scenario than makes for easy headlines. I wonder how this young man had felt as the jury deliberated, or indeed throughout this whole episode, knowing that he was accused of the dreadful slaying of an apparently popular young man, a man portrayed as an innocent victim in all this. A ghost bike at the spot where Michael McLean was run down and killed would make a big impact on a road which is one of the main routes into London, and I am disappointed that there isn't one. Fifty-five-year-old Daniel Duckfield, who has lived at The Crescent for the past five years, has spent most of that time lobbying for Pembrokeshire County Council, local MPs and the police authorities to crack down on motorists who park illegally in the town and cause hazards on pavements and footpaths to blind people like himself, disabled persons and pedestrians in general. "Pembrokeshire County Council has no policy or powers regarding parking on footways"
An extraordinary admission, which reveals how car supremacism infects every aspect of public life. Mr. Duckfield feels like his campaign to rid the town of inconsiderate motorists is going unnoticed, forcing him to take matters into his own hands, which landed him in hot water with the law only last week. “One morning I went down the town to do my shopping with my guide dog and on Commercial Corner I came face to face with a large car parked across the pavement, making myself and my guide dog walk on the road,” he said. “When I returned later there were more cars illegally parked there, which made me see red. When I got home, I ’phoned the police and told them that I had been ’phoning almost every day to try and get them to do something and, as no one was doing anything, I would take the law into my own hands this time and let the tyres down of any car that was still there and write ‘no parking’ on their windscreens with a felt tip pen,” he continued. The local police, though, didn’t take Mr. Duckfield’s remarks lightly and arrested him, taking him to Haverfordwest police station to be interviewed, before being released with a caution for making threats to cause criminal damage. “The experience I went through has shocked and upset me very much, but the incident is the only way I feel that someone will listen,” said Mr. Duckfield. “I am arrested for saying things on the ’phone and the culprits are getting off scott free, I am being punished for their actions, which is wrong. Dyfed-Powys police are not unusual, of course. British policing is rotten to the core with car supremacism, and the rot starts with ACPO and percolates all the way down. The police collude with driver crime on a gargantuan scale, and are crudely contemptuous of the rights of pedestrians and cyclists. COMPLAINTS against Dyfed-Powys Police have rocketed. The force has recorded the second highest percentage increase in England and Wales for the number of public complaints received against it. BOUGHT booze on his police Barclaycard, and DOUBLE-claimed expenses. The Crown Prosecution Service has ruled out any criminal action. This former Chief Constable, a man obsessed with drugs (but evidently indifferent to those with an addiction to fast cars and speeding - in the entire South Wales, Gwent and Dyfed Powys police force areas there are just 59 fixed speed cameras), advocated the execution of drug dealers, remarking “Personally, I would shoot." Anyone else who talked about shooting people would quickly find themselves arrested and on a charge. 5 deaths in 4 days on Welsh roads. it emerged that Mr Grange was accused of letting his personal relationship with a judge interfere with the force’s handling of child abuse claims against the judge - Mr Grange was the ACPO spokes person on child abuse issues. There’s an interview with Mr Duckfield here. Two top cops have been suspended for alleged dishonest conduct regarding speeding penalties. Surrey Police chief superintendent Adrian Harper, the divisional commander for East Surrey division, was suspended, today, (Friday May 22), for alleged dishonest conduct regarding the avoidance of speeding penalties. West Surrey division's superintendent Johnny Johncox has also been suspended for the same reason. It would be a pity to spoil a magnificent sea-front cycle lane with dirty tyres. This is why progressive Margate Council has installed numerous tyre-wash facilities completely free of charge. You have to ask yourself, would you put a lamppost in the middle of the road? No. The mindset is it is only a cycle lane, we won't do anything about it." The early signs from the first cycling cities and towns suggests that we can increase the number of trips made by cycling consistently by 10 per cent [a] year. Which would mean that cycling in, say, Bristol is increasing dramatically. I wonder if that’s really true? Awful, awful news – much worse than the regular crushing to death of women cyclists by lorries in London, which BBC London News has persistently ignored throughout 2008 and 2009. Yes, there has been a very bad traffic jam. A bus driver was reading a timetable just before ploughing into a pedestrian, a court heard. Crash investigator Pc Michael Baxter said the onboard CCTV camera caught the victim's brightly coloured trainers when he was 31 metres away. He added: "At 23 metres away, the camera shows it is absolutely clear that there is a person in front of the bus. But it's likely the driver would have seen him sooner. As far as the human eye is concerned, it would be very clear that there would be someone there before he appears on the footage, probably around two seconds before. Those two seconds are very significant. In my opinion, the collision is avoidable if the person is seen two seconds earlier." An 11-year-old girl was hit by a car as she used a pedestrian crossing in Leigh. After the collision, which occurred at about 4.45pm on Monday, August 24, the blue car involved initially stopped but then left the scene. The girl suffered a broken leg in the collision, which occurred on the A13 London Road, at the pedestrian crossing near to Waitrose. POLICE are appealing for witnesses after a young child received serious head injuries after being struck by a car on a pedestrian crossing in Salisbury. The accident occurred at about 11am on August 18 at the pelican crossing at the junction between Castle Road and Blue Boar Row. A 25-year-old woman was crossing the road carrying the child when they were hit by a green Ford Mondeo. These men are working on CCTV, which helps to deter people who commit anti-social behaviour. You know, the sort of yobs who park with all four wheels on the pavement, with no consideration for pedestrians. And we might have guessed - they’re from Essex. It's cycle friendly St Albans! CYCLISTS say a new £165,000 route across St Albans will barely be used and is a total waste of money. It’s the first day of this year’s climate camp. What sort of people are they who ride around on bicycles and think we should all be getting seriously worried about impending climate catastrophe? 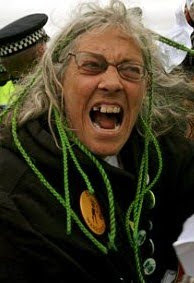 Today's Daily Mail helpfully supplies a picture of a typical environmental activist. Hundreds of thousands of young motorists are driving on the roads illegally because they do not have any insurance. New figures seen exclusively by Newsbeat show more than one in five 17 to 20-year-olds is not covered. The heats of the Young Driver of the Year Competition supported by the Mid Somerset Series have been completed. The 12 selected hopefuls go through to an action-packed day at the Bath and West Showground on Sunday, August 30, when they will be whittled down to three finalists. The day will comprise off-road 4x4 driving, manoeuvring an articulated lorry around a marked course, handling a specially adapted skid car, tackling a car with a trailer, a white van, an automatic car and finishing with an on-road drive in Driving Ambition's Audi A3 S-Line. One moment it’s buses and Austrian tourists, the next thing it’s trains. It was the start of a bizarre sequence of events. Three policeman covertly took photos from behind bushes around the square as the meeting went on. Motorists returning to unlocked cars to find items missing are discovering their belongings have been removed...by the police. Officers in Richmond upon Thames in south west London have been taking the items to shock drivers into being more careful about their property. Police have been removing such items as handbags, laptops and satnavs from unsecured vehicles. They have been leaving the careless owners a note telling them they can retrieve their items from Twickenham police station. Check out this appalling case of what our police delightfully identify as a case of suspected driving without due care and attention. Buxton Road E17 has two cycle stands, close to the junction with the High Street. These two pics show their condition this morning. The one above is obstructed by traders' pallets. The one below has evidently been the scene of a bike theft. A trucker mowed down and killed a cyclist in Wakefield before driving off and throwing the bike away, Leeds Crown Court heard. Mr Stubbs continued before stopping in a lay-by some miles away and pulled out the bike which, the prosecution say, he threw away into a field to destroy evidence. Mr Stubbs, of George Street, Bicester, Oxford, then drove back to his depot in Oxfordshire. The court heard he was an agency driver who was returning from delivering goods to Homebase in Wakefield when the accident happened. Police traced him through eye-witness descriptions of the vehicle and when arrested, he said he knew nothing about it. Mr Stubbs denies causing death by dangerous driving and perverting the course of justice. If three teenagers had been stabbed to death in a single incident this would be a massive story. But three youths killed in a car crash only makes the news because one of them had a footballing connection. The make of car and its top speed are not even mentioned, even though reckless speeding is likely to have been the cause of this fatal crash. A promising footballer was one of three teenagers killed when their car ploughed into a lamp post. Peter Lemaire, chairman of Ewleme Parish Council, accused operator Hazell & Jefferies of flouting the terms of its certificate of lawfulness development for years. A hit and run driver who collided with a 13-year-old cyclist in Bracknell is being hunted by police. A white Fiat Punto collided with the teenage cyclist in Hanworth Road at around 5.30pm on Sunday, but the driver left the scene. The worst offenders came from the Czech Republic where over 60 per cent of its drivers who were stopped on British roads in 2007-8 were found to be unroadworthy. More than one in two Polish and Hungarian HGV drivers were also found to be operating unfit vehicles as had over 40 per cent of Belgian, German and Italian trucks. Nearly 47% of foreign vehicles stopped were found to have dangerous defects, compared with 37.5% for UK vehicles. Hang on? Did I read that right? Over one in three British lorries has a dangerous defect? And what are the government and the police doing about it? We wouldn’t want to upset the road haulage industry, would we? Royal Mail is to phase out nearly all of the 25,000 British-made bikes used by postmen and women across the country because they can’t carry enough mail or travel far enough. Instead, postmen and women will be expected to travel to their patches in vans – and deliver their letters and parcels from trolleys made in China. It could also signal the end of neighbourhoods having their own dedicated postman. Environment Secretary Hilary Benn was accused of ‘howling hypocrisy’ last night after his own black bin bags, destined to end up in environmentally damaging landfill sites, were found to contain recyclable glass, plastic, cardboard, paper and food. Mr Benn was quick to make an excuse – blaming his children. A coroner has told the inquest of a teenager who died after she was struck by a lorry, it would be common sense for drivers to get help when reversing. The inquest heard that the lorry, when reversing, had no view through the rear view mirror because of the fridges and washing machines on board that were being taken away for recycling. The side mirrors also gave very little view creating a blind spot of around 2.5m (8.2ft), the hearing was told. John Wyn Williams, prosecuting, had argued that the defendant "quite simply cut across their path". He told the court: "The prosecution say that when you look at the driving, the prevailing conditions at the time, the lay-out of the road, there can be only one conclusion, that the manoeuvre that the defendant took on that fateful morning was indeed dangerous." Mark Roberts, defending, said, it was careless or inconsiderate driving - a momentary lapse and a mistake anyone could have made. The London Cycling Campaign is urging cyclists to report drivers they see using mobiles when behind the wheel. A review looked at four TRL studies conducted since 2002 and revealed more needs to be done to define a level of distraction considered ‘safe’. TRL research estimated that driver distraction contributes to 50% of all crashes, while a study earlier this year by the Virginia Tech Transportation Institute revealed that texting while driving increases the risk of collision by 23 times. This is just more LCC wishful thinking. Firstly, the government of Gordon Brown doesn’t give a toss about drivers using mobile phones. If it did it would introduce legislation that brought instant disqualification for a minimum of one year for anyone caught using a mobile. So indifferent is the Brown government to ‘road safety’ that it is still not an offence to drive using a non-handheld mobile phone, despite the known danger. Secondly, why should I waste my time reporting offenders to the Met? The Met is patently uninterested in enforcing road traffic law or in cracking down on drivers using mobile phones. And drivers know it. I hardly need to report such drivers: they go past Walthamstow police station on a very regular basis, as do speeding drivers (shown by the advisory speed sign outside) to the complete indifference of the officers inside. The car was using the disabled space despite the fact that normal parking bays were available just metres away. A 39-year-old cyclist from Bath has died after her bike was in a collision with a car on the edge of Box last night. The woman had been riding towards the village at around 7.20pm when she was overtaken by a light green Ford Focus. The collision, which happened on the A4 near the Platinum Nissan car dealership site, saw the cyclist come into contact with the bonnet and windscreen of the car. The narrow section over Bybrook with the double white lines is a death trap, motorists would rather mow down a cyclist than SLOW DOWN or cross the double white lines. I have had so many close calls along this road, you can't even escape and use the pavement as it’s overgrown and broken up, the drains are lethal many of them broken up, you have trees and foliage growing on to the road and the section coming out of Box down the hill after the traffic lights is like a dirt track from the third world certainly not befitting of a road to a world heritage city. This is the third crash to happen in Hatch Lane within two weeks. Last week I also started doing something that has already drawn disapproving glances. I haven't ditched my helmet after last week's deliberation but I have started wearing headphones. A Fraserburgh man standing trial over the death of a pedestrian had only driven a car twice before he was involved in a crash on a north-east road. Steven Duthie is accused of causing the death of Richard Jones by hitting him with a car on the B9033 Fraserburgh-St Combs road on May 23 last year. Duthie is said to have been driving dangerously, while unfit through drink. 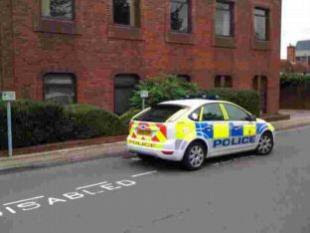 He denies the allegation, as well as an alternative charge of careless driving. Duthie, of 50 Finlayson Street, Fraserburgh, also faces charges of driving without a licence and without insurance. He denies all the charges. Another picture from the cycle lane outside Leyton Green Clinic (which lacks even one cycle stand). This picture just about sums it up, I think. London is a city which puts the interests of this 4X4 driver over that of cyclists. And while the media froths about young people carrying knives, it is perfectly relaxed (as are the police) about murderous bull bar attachments, suitable for killing child pedestrians at even less than 20 mph. But then I would not be particularly surprised if this vehicle belonged to an NHS worker or a police officer (or a teacher, or a magistrate, or a Crown Prosecution Service lawyer). All these drivers are quite legally parked in the cycle lane, which forms part of 'The London Cycle Network' and which here exists as nothing more than a token and wholly meaningless gesture towards cycling. And allows the Council to claim it has spent money on cycling, when in reality it has done no such thing. The 4X4 pulled out of First Avenue onto Porthill Bank, turning left towards the A500, when the cyclist was in collision with the tow rope. The vehicle stopped but left the scene before police arrived. The cyclist was taken to hospital for treatment. And a cyclist has been doored in Oxford. A CYCLIST was thrown 30ft from his bicycle when he was hit by a vehicle near Snitterfield, this morning (Friday). The driver failed to stop, “leaving the cyclist for dead”. The 42-year-old man who was wearing a high-visibility reflective jacket, was believed to be cycling to work, when the incident happened on the southbound carriageway of the A46, near the Snitterfield turning, shortly before 5am. He suffered a serious head injury, broken collar bone and severe abrasions, and was taken to Warwick Hospital by West Midlands Ambulance Service. The impact of the crash had thrown the cyclist 30ft into the middle of the road. His helmet and trainers were also thrown off in the impact. PC Pat Kearney from the Operations Task Force, which includes roads policing, is investigating the crash and said: “This driver would undoubtedly be aware they had hit the cyclist. The driver has then driven off leaving the cyclist for dead, lying in the middle of the carriageway. However even if caught and successfully prosecuted, you can be quite certain that the guilty driver will not be banned from driving for life but allowed back on the roads. A dustcart driver who crushed a cyclist to death, has avoided jail - angering his victim's family and friends. Trevor Ashworth, 31, was fined £500 and banned from driving for eight months today after being found guilty of careless driving. Judge Loosley said Ashworth had driven without due care and attention because he had been making mobile phone calls shortly before the collision, and failed to notice his faulty mirror. Which is not carelessness, as the Judge said, but wilful and conscious recklessness. The parents of an Oxford university student who was knocked off his bike and killed are suing the driver's insurance company. Engineering undergraduate, Tsz Fok, 22, was killed in a collision with a bin lorry on Broad Street, Oxford in 2007. The minister suggested that low-carbon transport such as electric cars and a new generation of airliners could cut emissions without curbing travel. While I'm in the mood to kick the drug addicts (oil and car) who run the NHS, let me draw attention to Leyton Green Clinic. Here, both the health trust and the council collude to encourage car use and to deter cycling. (Below) There is extensive free car parking outside the clinic - in the cycle lane. The council could introduce yellow lines to stop motorists parking here, but when there's a conflict of interest between the lazy motorist who wants on-street car parking and the cyclist, the council's priority is always the lazy motorist. This cycle lane is comprehensively obstructed every day of the year and is completely pointless. However, it does allow the council to claim it has provided over 20 miles of on-road cycle lane, and where cycling is concerned it's statistics that really matter, is it not? (Below) There is ample room for cycle stands outside the clinic. But no one has ever thought of introducing them because the NHS is run at every level by car addicts. A CYCLIST injured after her bike was tampered with has said she will never ride again. Jean Stubbs, 54, was thrown over the handlebars of her bicycle in High Street, Clifford, around noon on Wednesday, August 12. Police initially believed Mrs Stubbs may have hit a pothole in the road, but on further investigation the cause was found to be more sinister. Sgt Matthew Appleyard of Wetherby Neighbourhood Policing Team said: "Police have examined the bike and it would appear that the front wheel nuts had been tampered with." Nothing can embarrass this crap council. Its cycle stands are obstructed day after day, week after week, month after month, year after year. Its contempt for cycling shines out in a thousand different ways. “If a hospital is in central London, I agree that we should use public transport. “However, if a hospital is in the middle of nowhere and public transport is very limited, why do we have to pay to park in a staff car park given we have already spent petrol and car maintenance money to come to work? Sobs Dr Stanley Yu, who is a typically lazy, car-dependent NHS worker. Obviously walking, cycling, buses, trains and tube trains are too good for the likes of complacent Dr Yu. He works at Barts, which is in easy walking distance of three tube stations - St Paul’s, Barbican and Farringdon. He lives in N11, i.e. in either Enfield, Barnet, Haringey, all of which have perfectly adequate public transport links. Dr Yu describes Whipps Cross Hospital as being “in the middle of nowhere”, which is laughable. The hospital’s own website provides information on how to reach it by train, bus or bicycle. Dr Yu could hop on a train from Liverpool Street, arrive at Wood Street station in 20 minutes, and walk to the hospital. 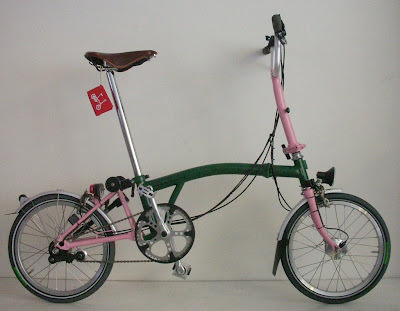 Or unfold a Brompton and cycle. He’s not unusual, of course. The world is full of people like him, whining about how they MUST use their cars. I know a teacher in Waltham Forest who drives along just three streets to school. A transport option made attractive by free staff parking. I think it’s probably the case that ALL schools in Waltham Forest provide free parking for staff. Staff at Whipps Cross apparently pay £1 a day to park – a risibly small amount. Charge them £20 a day. Squeeze these NHS oil addicts until they discover public transport or cycling. It won’t happen, of course. The NHS promotes ill-health and climate catastrophe. The NHS is a sick institution, run by drug (oil and car) addicts, rotten from the top down. Spotted on Lea Bridge Road E10 yesterday - the white male driver of a Transport for London Dial a Ride red bus reg. YX09 EUL using a handheld mobile phone. The driver turned into Merton Road E17, still chattering away. 2.24 pm. 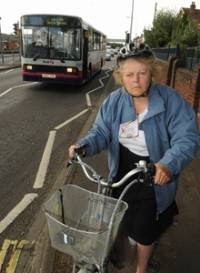 Andrea Rossini was making her regular ride into Fareham when a single-decker bus pulled out from the bus station and narrowly avoided her as she cycled past Hartlands Road roundabout. The shaken 61-year-old immediately went over to the First bus station offices, opposite the roundabout, to complain but says she was more or less ignored by staff. 'One of them raised her arm and just said "enquiries there" without even acknowledging me. When I pointed out I had nearly been knocked off my bike they didn't say anything. Barish said he was heading to dinner on A1A with his convertible top down on Aug. 13 when he came upon a group of cyclists riding in front of him. They were taking up the entire lane. He tapped his horn a couple of times to let them know he was passing, Barish said. Some witnesses, according to a police report, said Barish hit one of the bicycles as he was passing the bike pack. McDonald told police he never touched Barish and was trying to calm everyone down. He said Barish hit him in the jaw. Well, you can guess who the police arrested and charged with two offences. Reg. EA08 ABZ, Black car, male Asian driver, using handheld mobile phone while driving along Hatherley Road E17 today, 11.33 am. Weymouth police are working flat out to crack down on the most dangerous and anti-social elements in our society. A CABBIE who almost killed a pedestrian when he fell asleep at the wheel has been jailed for 10 months. And he’ll be allowed back behind a wheel in two years. POLICE are appealing for any witnesses to a collision in Murray Street, Filey, that left an 87-year-old female pedestrian with a fractured hip. Police said it was a female driver who, despite stopping at the scene to help, failed to provide any details. Officers are trying to trace the driver. The quad bike hit 75-year-old pensioner Irene Bryan, of Burnley Road, Halifax. She was on the footpath and died from her injuries. This magnificent cycle lane in Ramsgate (exquisitely maintained, as cycling facilities always are) allows right-turning cyclists to go in the middle of the carriageway. But, quite sensibly, it runs out some two metres before the junction, in order not to impede right-turning motor vehicles. Angry motorists burned down a speed camera - after police handed out fines to 151 drivers over just three days. Two fixed cameras on the Ringwood Road in Verwood and Three Legged Cross, east Dorset, were targeted in the early hours of Saturdays August 8 and 15. The second incident came after Dorset Police issued 151 fixed penalty tickets, costing between £60 and £200, in the three-day period between August 11 and 13. I’m not sure why the Chief Inspector is so surprised. Motorists are the most lawless group in society. Of course the person or persons who destroyed the speed camera were not ‘angry motorists’ but the small bunch of terrorists who go by the name of Motorists Against Detection and have a website, run by Captain Gatso. The intelligence services and police know perfectly well who Captain Gatso is but show no interest in battering down his front door, seizing all his computer equipment, and arresting the Captain, his family and associates. Which is odd, since Captain Gatso incites arson and violence and boasts that he has personally committed these offences. There seems to be a clear case of conspiracy here but the CPS seems as reluctant to act as it does when a van driver runs down two cyclists, killing one, and says he just didn’t see them. If Captain Gatso claimed to be inspired by the Koran and acting on behalf of Islam I imagine things would be different. Meanwhile, orchestrating attacks on speed cameras – ACPO, the CPS and Gordon Brown are entirely relaxed about such trifles. Research last year showed that texting while driving impairs motorists more than being under the influence of drink or drugs. So, an obvious case for an immediate driving ban on anyone caught texting at the wheel, a stiff fine, and the requirement to sit a new driving test? As you can see, this new improved cycle lane on Leyton Green Road E10 has really made a difference to cycling. It operates on a "shared use" principle. Car owners can park in it every day of the year, without restriction. The rest of the time it is for the use of cyclists. It’s interesting, is it not, that you can overtake a right-turning cyclist, knock him off his bike, hospitalise him, and not even have to bother turning up in court. Needless to say you are permitted to continue driving. A Queniborough woman whose car was involved in a collision with a cyclist in Syston has admitted driving without due care and attention. Audrey Faulks (58), of Barkby Road, pleaded guilty by post to the offence which happened on January 28 on Melton Road. Claire Palmer, prosecuting at Melton Magistrates' Court on Thursday, said: "A cyclist was pedalling along Melton Road indicating and manoeuvring to turn right into a minor road on the offside when the defendant, travelling in the same direction, started to overtake the cyclist. "A collision occurred causing injuries to the cyclist's head, back, the trunk of his body and his thumb resulting in him being detained in hospital for 24 hours and subsequently to be on crutches for walking while he recovered." Faulks offered no mitigation in her letter to the court. A driver has evidently "lost control" on the bend, careered on to the pavement and smashed into the railings on Hoe Street, by the roundabout at the junction with Selborne Road. There has been nothing in the local press. If no one was injured this will not count in the annual road casualty statistics, allowing government ministers to claim that our roads are safer than ever, even though the evidence of reckless driver violence is everywhere. Worshipping the Lord is all about arriving by car and hiding your treasures. With the assistance of the Metropolitan Police, the vicar of St Mary's in Walthamstow Village has enhanced his spiritual domain with this new notice. I wonder what car Jesus drove? I feel it is unlikely the police will do anything about it, seeing as they did nothing last year when a van pulled out of a side street straight into me, the driver claiming he hadn't seen me. And this case of police declining to investigate further is quite extraordinary and scandalous. Police have launched a crackdown on cyclists riding the wrong way down a one-way street. This marvellous new trap, generously sponsored by ASDA, allows pedestrians to be captured in a stylish steel cage. Once trapped, the pedestrian may be humanely disposed of. Shown here on Seaford Road E17. 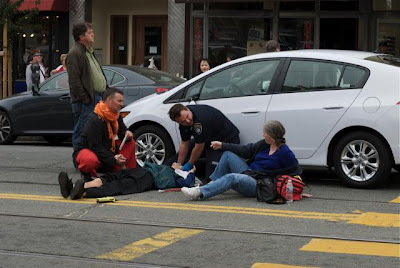 a bunch of witnesses were mumbling something about the woman driving the car talking on a cell phone and that the pedestrian had the right of way (~7 seconds left on the crosswalk signal)." Cyclists using a busy Norwich road are being warned by police they face a £30 fine if they illegally use the footpath. 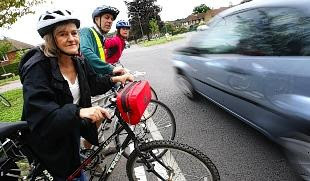 People living in Earlham Road have complained to the Earlham, Larkman and Marlpit Safer Neighbourhood Team that cyclists using pavements is making them feel unsafe. PC Sarah Duzbury, from the team, said: “Footpaths are there for the safety of pedestrians - not cyclists, who should be using the road at all times. There is a risk to pedestrian and cyclist safety, especially from residents moving their vehicles in and out of their driveways. As it happens I know that area. There is widespread blatant, unlawful and obstructive pavement parking by residents which neither Norwich police nor the crap Council appear to give a toss about. The Mayor of London: "I'm sure that the cycling revolution taking place in the capital will rapidly become the envy of the world." That's right, Boris. David Hembrow must be kicking himself he moved to the Netherlands, when instead he could be luxuriating in the magnificent cycling environment to be found in the London Borough of Waltham Forest. Like this cycle lane on the A503. Two years ago the Council decided to shift the cycle lane out away from the kerb, in order to accommodate parking bays. Never mind that this is on a bend, on a section of road with a phenomenal record of crashes, fatalities and drivers "losing control". Mainly because of speeding. The cycling officer didn't want the lane moved, and neither did the local branch of the London Cycling Campaign. But shopkeepers have more clout with councillors than residents. And because there is a cafe here, the bays are popular with HGV drivers who stop for a cuppa. As the driver of this vehicle is probably doing (there are no roadworks in the vicinity). Tuesday evening. I was almost at the end of Leyton Green Road (B159), approaching the junction with Lea Bridge Road (A104). The lights were at red. The ASL was empty. And just as I approached it, this yob overtook and occupied it. I fired off this snap just as the lights changed. The same thing happened the following day. NC51 VZE, white blonde woman, female companion, 4.35 pm. Oh really, Sue? As a cyclist I think I am getting zero value for money from the money I have to pay in council tax to your crap police force. The Met is a bigoted car supremacist organisation which is indifferent to its duty of care to vulnerable road users. Thousands of crimes are committed everyday in Waltham Forest but as they go unrecorded they don't concern the Met. Stand at this junction, or at The Bell Corner, or at numerous other junctions, Sue, and watch the hundreds of crimes committed there every day by drivers. They unlawfully obstruct the ASLs for cyclists, they chatter on handheld mobile phones, and, at The Bell, they then they go speeding off past Walthamstow police station, where the fatuous "advisory" speed sign registers (or rather, doesn't register) thousands of speeding offences everyday. And frankly, Sue, neither you nor Benbow give a toss. The number of pedestrians injured on Aberdeen roads has reached its highest level for a decade, new figures reveal. Questions were being asked last night after it emerged that the number of pedestrians seriously injured on city roads more than doubled between 2007 and 2008. Each fatality on Scotland’s roads costs taxpayers an estimated £1,648,390, while every serious accident costs £185,220. Pedestrians are subjected to the same selfish attitude by many of the drivers in Aberdeen the cyclists and motorcyclists are subjected to on a daily basis. The reason for this is due to the lack of "everyday policing" that appears to have vanished from the city. 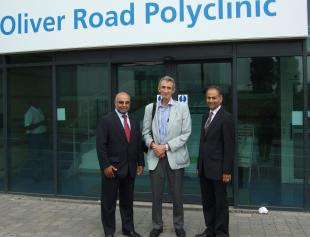 AN NHS boss has given the new Leyton Polyclinic his seal of approval. Sir George Alberti, national clinical director for emergency access, visited the Oliver Road clinic to see whether the new clinic is working well. Part of a tour of London health services, Sir George was “delighted” by the new service, which officially opened its doors earlier this year. Well, Sir George, as a user of the Oliver Road Polyclinic I am not delighted. In fact I think this Polyclinic is the perfect symbol of the car-sick, complacent, ill-health promoting NHS. If I turn up by car there are three parking bays, conveniently situated near the entrance. If I turn up on a bicycle there is nothing. There's ample room for cycle stands, is there not? But the nearest place to lock a bike is that traffic sign pole by the parking bays. Sir George is a big cheese in the National Health Service. But, like a lot of people who run the NHS, I bet he doesn’t cycle to work, or ever rides a bicycle – except, perhaps, to stash one on the back of a 4X4 and head off to a CenterParc or some nice converted railway line in the countryside. "Oliver Road Medical Centre is a great example of how PCTs are working to bring services together, in great buildings, nearer to where people live. • Joan Saddler OBE, Chair, Waltham Forest Primary Care Trust. • Dr Ken Aswani MBE, PEC Chair. • John Morton, Chief Operating Officer and Deputy Chief Executive. • Steve Dawson, Director, Leyton Orient Football Club. • Chris Baker, Safety Officer/Stadium Manager, Leyton Orient FC. • Harry Cohen MP, Leyton Wanstead MP. • Alastair Finney, Head of Reconfiguration, NHS London. • Dr Sunanda Gupta, Consultant Community Gynaecologist. • Dr Faduma Hussein, Community Health Advisor. • Alison Nettleship, Specialist Respiratory Nurse. • Susan Murray, Tissue Viability Specialist Nurse. • Judy Dakin, Specialist Continence Nurse. • Suraiya Kholil, Specialist Diabetes Nurse. • Cleo Solomou, Pharmacy Manager, Leyton Orient Pharmacy. • Dr Dinesh Kapoor , GP Principal and patients. The person standing to the left of Sir George in the first photograph is Cllr Afzal Akram, Chair, NHS Waltham Forest. The current issue of the Council’s free newspaper features Cllr Akram promoting Change4Life (yes, that crap). He is shown promoting 'a virtual bike race' - which for all I know is the nearest he ever gets to a bicycle. If you live locally, you can contact Cllr Afzal Akram, Chair, NHS Waltham Forest here. I think both of them have some explaining to do. Such as why they think the total absence of cycle parking outside the Oliver Road Polyclinic is acceptable. Such as why Chingford Health Centre has free parking for cars and not a single cycle stand. Such as why Whipps Cross Hospital is a car-sick institution which has parking for 1100 cars and just 16 totally inadequate cycle stands. Such as why surgeries and NHS clinics across Waltham Forest have car parking but not even a single cycle stand. Let me summarise. The NHS is a diseased, car-sick institution, run by drug addicts in thrall to oil and car dependency.